Enjoy your vacation in the privacy of this completely and professionally furnished four bedroom, three and one-half bath, air conditioned home with screened and heated pool. The oversized villa is in a quiet and secure neighbourhood. 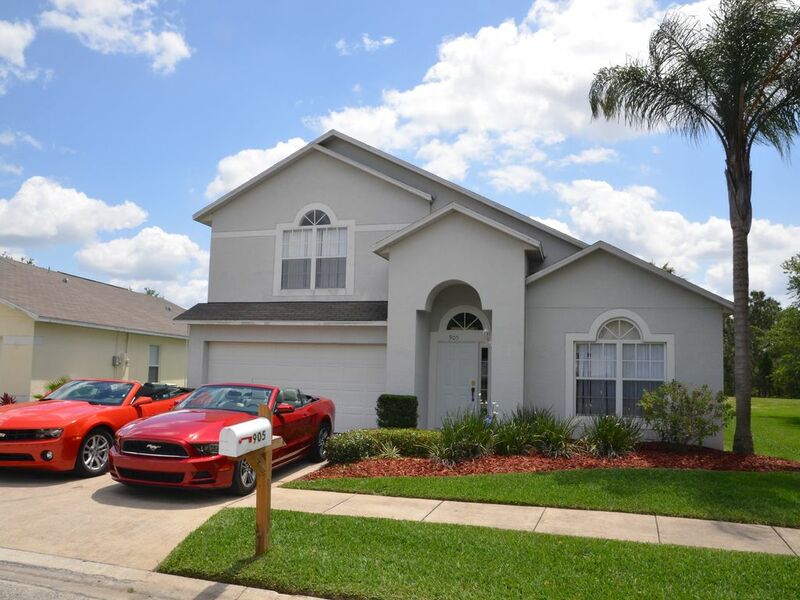 This faboulos villa is located only 15 minutes (via new 429) from Walt Disney World. Near all other attractions! Lovely and professionally maintained house (build in January 2001) on a big lot and on a beautiful lake and wooded conservation area beyond. Large house (2300 square feet) has two master bedrooms, both with king-size beds and jacuzzi. The third bedroom is special for kids and has a bunk bed for kids pleasure. Perfect for two couples with their children. The fourth bedroom has two twin beds. Beds include two king-size, one full-size, three twins, and one sleeper sofa. The home has a living room, family room, a formal dining area, and a breakfast nook. The family room has a 50-inch TV, a Dolby-Digital System and a Bluray-player. Extended Cable-TV (Sports and Disney-Channels included) is also provided. The villa has also a broadband internet-connection with a Wifi provided. Big 9-foot by 40-foot, covered lanai with extended pool-deck including a barbecue grill. The fourteen-foot by 30-foot pool with spa overlooks the lake. The kitchen is fully equipped with all the necessary housewares and appliances included a bis washer and dryer. The house is in the 'Clear Creek' subdivision on US 27/US 192. A Walmart and two Publix-Supermarkets are nearby. This is also the perfect location to day's exursions to the Kennedy Space Center (60 Minutes), the beautiful Gulf beaches (70 Minutes) or Atlantic beaches (60 Minutes). We are a family from Switzerland and fell in love with Florida. So we decided to build our own villa. We love to sit around the pool and enjoy the views of our little lake and the conservation area around it. We build this vacation villa from ground up, and put all our expierences in from our earlier vacation rentals. So we optimized our vacation expierence and so we hope your's too. We have the big covered lanaii to stay outside, the big pool deck, and the big pool itself. We love to enjoy the whirlpool after a busy day at the parks. We always wanted something next to water and with a beautiful view. Our unique benefits are the two upscale masterbedrooms in our villa, whicht makes it the perfect spot for more then 4 peoples. Oversized lot on a little lake on a conservation area. WIFI provided and works in every place in the house. We have everything you'll need for your stay. (5) 5 different Games (Driving and Sports) or bring your own PS3 games. Outside Private Hot Tub: Enjoy it after a long day in the parks with our new installed timer (works also after pool hours).